Vinyl music records are making a major comeback today. Turntables that were once gathering dust in storage are now being used as the main music players around most homes today, and even in parties. Those who don’t have vintage record players are now investing in new ones to get a taste of the good old memories. To enjoy music from vintage records, you’ll need to invest in speakers that are suitable for delivering the best sound from such records. However, not all speakers can do that. Thus, you need to get the most suitable option to enjoy your vintage music in the best possible way. But how would you know the best speakers for vinyl? We have made it easier by reviewing the best options. This way, you’ll rest assured of investing in the most appropriate speakers. Here is a review of the top 5 speakers for vinyl. ELAC Debut made it to the top of our review based on its strong build quality and great performance. This speaker is designed to offer what other models in the ELAC series failed to offer. Here is why this speaker made it to our list and why it is worth your consideration. Aramid fiber woofer- This speaker comes with a 6.5 inches aramid fiber woofer. The woofer delivers deep bass, making sure you don’t miss on any lows. Silk dome tweeter- Each speaker comes with a one-inch silk dome tweeter. These tweeters deliver the highest frequencies such that you will hear even the highest notes. Extruded dust cap- The driver that comes with this speaker features an extruded dust cap. It assists in increasing the frequency response of the driver while still enhancing the cooling effect of the speaker. Waveguide technology- This speaker is built with waveguide technology for the best sound effects. This technology makes it possible for the speaker to produce full-range sound from a small space. Bass reflex enclosure- The speaker enclosure is designed as a bass reflex enclosure system. This enclosure design drives sound waves outwards in a way that boosts the overall level of the sound. Our Verdict: ELAC Debut 2.0 B6.2 is specially designed for anyone looking for a powerful speaker with a strong build and full-range sound. Consider checking it out and you won’t get disappointed. Mackie qualifies to be on our list based on its performance and design. It’s designed to deliver unmatched studio-quality sound for the best entertainment and multimedia creation. All its greatness comes at a very affordable price. Here’s why you should consider this speaker. Multimedia creation quality- The design behind this speaker is a speaker that can be used for multimedia creation. Thus, its performance is unmatched when it comes to playing music records. Convenient controls- The speaker comes with a volume knob at the front. You can easily turn the volume up and down using the volume control knob. Aux input- The speaker comes with an Aux input port at the front panel. You can attach your portable music player to the speaker and enjoy louder sound. Headphone output- Another key feature that comes with this speaker its headphone output at the front panel. You can plug your headphones in this port for a more personal sound experience, especially when you don’t want to disturb other people with loud music. Speaker placement switch- The speaker comes with a switch that allows you to switch between the left and the right speaker channel. This allows you to enhance your listening experience, especially when listening to stereo records without changing your seating position. Our Verdict: Mackie CR3 is specially designed for anyone looking for an affordable, yet reliable speaker set for studio-quality sound. Thus, this speaker set is worth your hard-earned money. Polk Audio S10 stands out for its unique and stylish design. It has exclusive features that make it one of the best speaker system for vinyl. It’s specially designed to add surround sound experience in any living space. Read on for a detailed review of this speaker. Multiple usage options- You can use this speaker set as satellite, surround or rear speakers. You can even use it in a 5.1 or 7.1 or 9.1 speaker channel set up. Terylene tweeter- This speaker is unique in that it uses a high-resolution tweeter made of terylene fabric. This type of tweeter delivers crystal clear highs. Mica-reinforced speaker cones- The polypropylene cones that come with this speaker are specially reinforced with mica. This allows for clearer and cleaner bass. Power port technology- Polk Audio S10 is specially designed with the renowned power port technology. This technology enhances the bass output of the speaker, making it deliver more immense bass. Keyhole slot- This speaker boasts of having a keyhole slot. The slot makes it easy to mount the speaker on a wall. Our Verdict: If you’re searching for a high-performance speaker with a stylish design, yet affordable, Polk Audio S10 is your sure bet. Thus, consider it in your shortlist. Klipsch R-15PM is specially designed for use with turntables. With this speaker set, you will not have to use a receiver when connecting to a turntable. Moreover, it offers room-filling sound, all in a compact design. It’s also made with quality assurance in mind, that’s why we considered reviewing it. Here’re its hits and misses. Phono inputs- The speaker comes with phono inputs. You can easily connect a phono preamp through this input to feed the speaker with a boosted signal. Analog input switch- This speaker features a switch for selecting between phono and line inputs. This makes its input ports more versatile. Ground terminal- The speaker comes with a ground screw terminal. This terminal makes it easy to ground the phono preamp. Remote control- Klipsch R-15PM comes with remote control. The remote control is full-featured and uses infrared wireless technology. Bluetooth enabled- You can connect your Bluetooth devices to this speaker. This way, you can enjoy streaming your music wirelessly. Our Verdict: Klipsch R-15PM has proven to be extremely versatile in terms of the devices you can connect. Thus, anyone looking for speakers to power their vintage or new turntables should consider this speaker set. If there’s a speaker designed for versatility, then it’s Audioengine A2+. Thus, you can easily connect most music devices. It’s also worth noting that you can even connect a vintage turntable to this speaker system. Moreover, Audioengine A2+ is made of high-end components for enhanced quality. Here’s why this speaker system made it to our review. 2-way system- This speaker system is designed as a 2-way speaker unit. It features a passive and an active speaker, whereby the active speaker powers the passive one. Compact design- This speaker system is small and compact in design. Thus, you can use it in almost any space, including on your desktop. Versatile- You’ll surely appreciate the inputs that this speaker has. Its multiple input types make it possible to connect most major types of music devices. Subwoofer connection- The speaker has a dedicated subwoofer output port. You can easily connect a subwoofer to this speaker system for more bass. Inbuilt amplifier- The inbuilt amplifier that comes with this speaker allows you to boost the signal coming from your turntable or any other compatible source of sound. This enhances the sound you get from your favorite music player. Our Verdict: This speaker system is outstanding in terms of delivering high-quality sound. It’s worth your consideration, especially when looking for a compact speaker set that can fit on any space. While there’re many great speaker options to choose from for your vinyl record player, not all of them are made equal. Some speakers outshine others in certain features, that’s why it’s important to know what to lookout for when shopping for vinyl speakers. With that said, here’re the things to consider before buying the best speakers for vinyl. When setting up your turntable with an audio system, you would want the easiest connection option possible. The easiest connection to set up is the one that uses the least number of audio components. Using minimal audio components makes it possible to set up a sound system with your turntable even in the smallest space. You also save more money when using fewer components. As such, it’s ideal to consider a speaker that has an inbuilt amplifier. This means that you’ll not have to invest in a separate amplifier to power the speaker system. You’ll simply attach your turntable directly to the active speaker and enjoy your favorite vintage records. Such a sound set up is easy to work with and will obviously cost you less of your money. It’s always more enjoyable to listen to music with a sound system that delivers full-range sound. This means that you should invest in a speaker that delivers low, midrange, and high frequencies. This is most important for audiophiles. Thus, consider a speaker that comes with a woofer or a sub for lows and mid and tweeters for highs. The woofer and tweeters should be powerful enough for the kind of lows and highs you want. This way, you’ll enjoy all the details in your music records. It’s always best when you have more control over a sound system. Thus, the best speaker system to go for is one that has some sound controls. For instance, a speaker that allows you to control the volume means that you can easily turn the volume up or down as you like without having to reach out to the turntable. If it has more sound control options, you’ll find it more useful. If the control options are limited, then you may have to invest in an equalizer for more control on the sound. Different speakers have different types of inputs. Some have more inputs than others. The best option should be the one that has the type of input which is compatible with your music player. For instance, if you want to attach your turntable, go for a speaker that has compatible inputs. For more versatility, consider a speaker that can be hooked with different types of music devices, just in case you would want to connect a different device along the way. Also, you should consider the types of outputs that the speaker has. This is to enable you to hook the speaker to other components such as headphones and subwoofers. While size does not determine the performance of a speaker, it matters when it comes to portability and space. If you’re limited in terms of space, you should consider a more compact speaker. For instance, if you would want to use the speaker on a desktop space, then you should definitely go for a more compact speaker. Also, if you’ll be moving the speaker from one place to another on a regular basis, then consider a portable speaker. However, if you’re not limited in space, and portability is not a concern, then size may not be a big issue. Turntables are a great way of reminding oneself of where music has come from. While there’re modern music players available today, including digital music, there’s a growing trend among many individuals who are going back to the old way of listening to vinyl records. Thus, most people are now going through their storage to dig up their long-forgotten vintage turntables while others are investing in new units. This is with the aim of enjoying music from vinyl records. 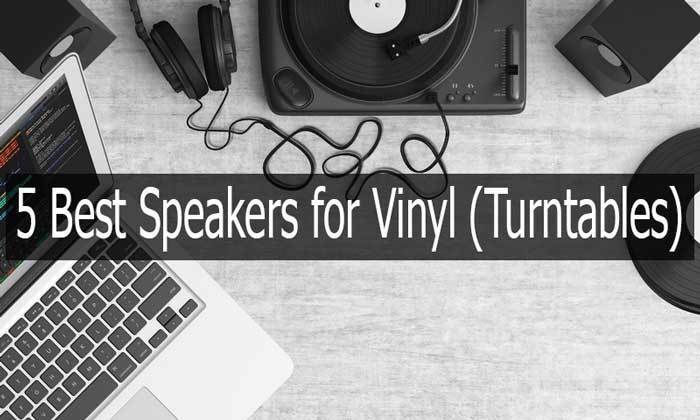 In case you have a turntable, you’ll surely need compatible speakers to connect your vintage unit. With this review and buying guide in mind, you’ll surely make a more informed decision when looking for a speaker for your vinyl. You can also check out Has-Sound for more tech reviews.